Coming together with partners can often help stretch valuable resources for a project, but it can also amplify and improve the outcomes of the project itself. That’s what happened in northeast Nebraska when Nebraska Indian Community College joined forces with the Omaha Tribe, the Santee Sioux Tribe and the Center for Rural Affairs to get more bang for the buck on a food sovereignty assessment effort. In keeping with its commitment to serve the two tribal nations, NICC was one of the recipients of grants awarded to 39 Native American tribes and organizations to help them conduct food sovereignty or community food assessments in their various locales, from 2016 to 2017. First Nations Development Institute (First Nations) provided the grants, totaling nearly $650,000, under its Native Agriculture and Food Systems Initiative, with generous support from the W.K. Kellogg Foundation and the Indigenous People’s Fund of Tides Foundation. 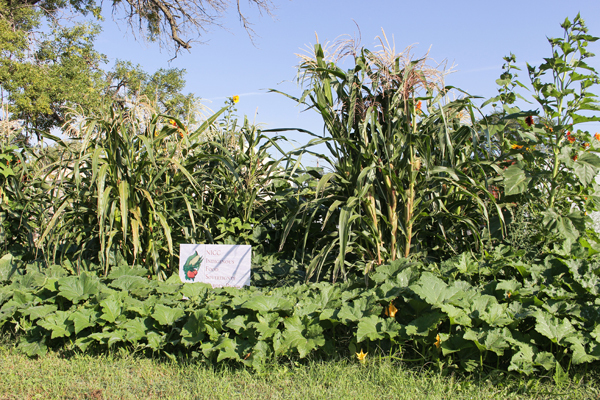 The grant allowed NICC to partner with the Santee and Omaha tribal governments and programs, and the Center for Rural Affairs (CFRA) located in Lyons, Nebraska, to carry out activities to encourage community participation in the food sovereignty assessments. Berger is the grantwriter for NICC and the grant manager with the project. “We serve 170 students at three locations, and have less than 10 faculty members. We’re a very small tribal college and without partnering we couldn’t have implemented a food sovereignty project. We have limited staff, and partnerships with this project greatly expanded our reach into our communities,” said Berger. The tribes, NICC and CFRA first held group and individual discussion groups to talk about the food sovereignty projects for both tribes, and the goals of gaining a “broader understanding of the current Santee Sioux and Omaha food systems, and how to build interest and support” from the communities being served, according to their project report to First Nations. Information was shared at several locations in each tribe’s community, including the Omaha Pow Wow Committee meetings, Omaha Advisory Health Fair, the Santee Health Center, and the Walthill library, to name a few. Surveys were handed out to community members at various events, and were gone over one to one at some events like the Rosalie Old Settlers Days, the Santee Health Center Diabetes Program’s Greek salad cooking class, and the Omaha tenant education class. While social media was used to get initial information out to the communities, it was the activities that were held in person that were the most successful when talking about food sovereignty and getting surveys, which in the end numbered more than 500 participants total for both tribes. “The survey established and identified what we need to address and the interesting pathways that we are looking at delving into for the delivery of vegetables – such as mobile ‘veggie vans’ and working with the tribes to develop a delivery system for people who request fresh vegetables. 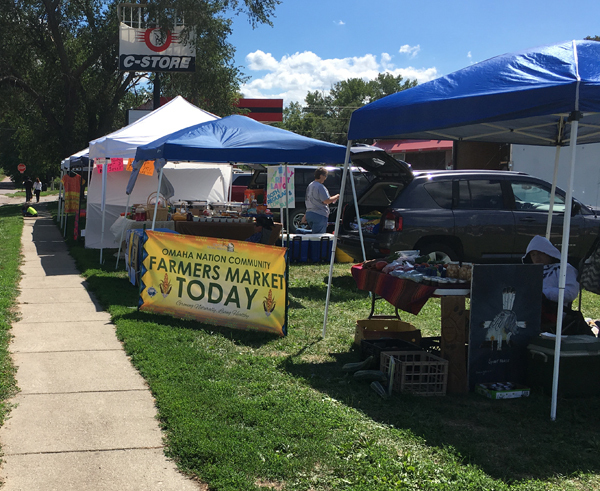 At the local grocery store, vegetables are imported, but with a mobile grocery store – that could create a market for area farmers,” said Berger. The idea of mobile “veggie vans” would not only provide access to fresh produce, but also fill in the transportation gap that many tribal members experience on both reservations. Even if someone has access to a car, they face an hour or longer drive, one way, just to reach the nearest big-box store. Add on the cost of gas and car upkeep, and this often puts a trip for fresh produce out of the reach for many tribal members. 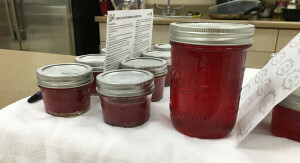 In addition to creating access to heathier fresh fruits and vegetables, the surveys indicated there is a strong interest in revitalizing the growing of traditional foods within the existing community gardens and providing access to traditional foods to community members who can’t grow their own. “The communities would like to see a Native seed bank happen, where seeds and roots stocks can be reintroduced. But instead of sending out seeds, keep it in the community and then they own stock in community,” said Berger. There were some traditional foods that drew a large interest in terms of learning how to grow or access the foods, and how to prepare the traditional dishes. 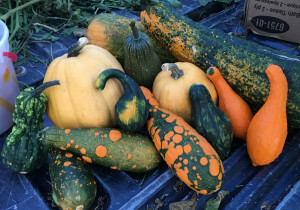 “Venison, squash and corn were the top three traditional foods requested by survey participants, so for us as a college, we’re interested in what types of foods the community members are interested in. It’s also good for us to find out what local farmers were interested in cultivating,” said Berger. 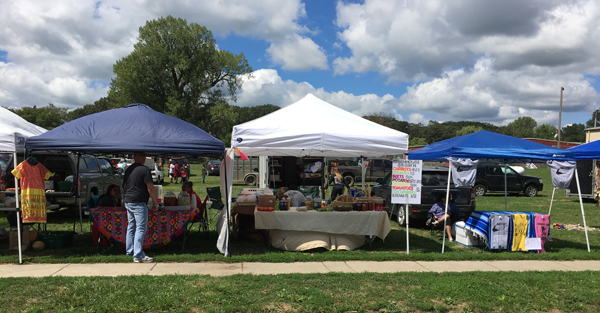 CFRA oversees farmers’ markets on behalf of both tribes and there is a great interest by both the food producers and consumers to have access to more locally-grown foods. In addition, interest in family or community gardens and container gardens has been on the increase for the past few years in both tribal communities. CFRA works with both tribes and offers garden technical assistance for the challenging growing conditions. In 2017 alone, there were nearly 300 requests for support. “The community gardens have really started taking off. Also, cooking and canning workshops are offered so we can better educate the community on food safety, drying and canning,” said Suzi French, Community Food Specialist with CFRA and an Omaha tribal member. The food sovereignty assessments have already had a great impact on the Omaha and Santee Sioux tribal communities and the Nebraska Indian Community College, Berger added. The assessments now provide the groundwork and direction for further community-developed proposals to address such areas as the seed bank, how the college fits within food sovereignty, and the overall impact on the health and wellness of all the communities. This entry was posted in NL07 by rblauvelt. Bookmark the permalink.